The training is a five-day live training program with an exerienced team of renowned instructors who will prepare attendees to pass the business valuation certification (CVA) exam. The Core Body of Knowledge for International Business Valuations (BOK) has been launched in 2017 — along with the International CVA Exam. The BOK and International CVA Exam are global in application to business valuation methodologies and approaches. 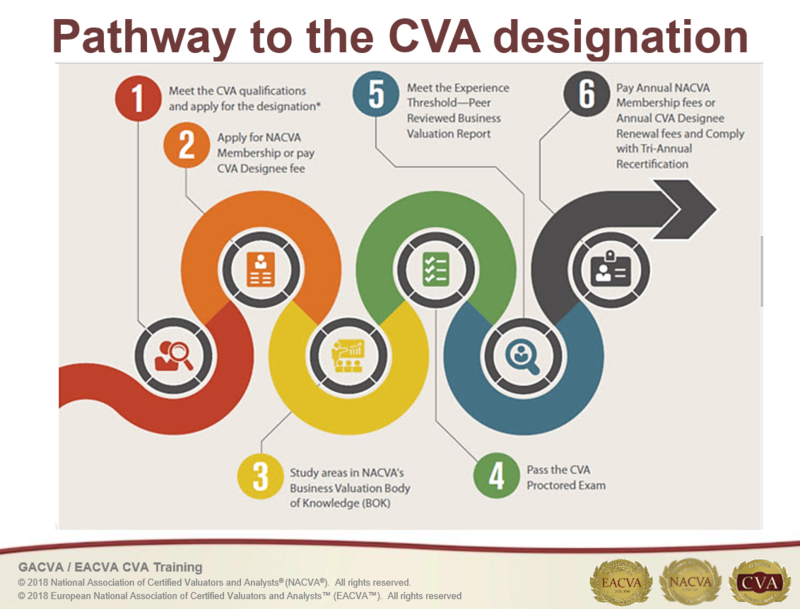 The CVA training offered globally follows the curriculum as described in NACVA’s Business Valuation Certification and Training Center. NACVA’s international chapters are able to develop and teach supplemental content specific to their country or region, but this supplemental content is not tested to on the International CVA Exam. Supplemental content can be added to the International BOK as an appendix. Part One (testing knowledge) is a comprehensive, five-hour, multiple-choice, proctored examination, which is administered at the conclusion of the five-day training. It consists of multiple-choice/true-false questions, testing applicants on EACVA’s/NACVA’s Business Valuation Body of Knowledge. Candidates perform a valuation and write a Fair Market Value/Market Value business valuation report of a minority share of a small or mid-sized stock listed company. In most cases the companies are selected from the countries of origin of the individual attendees. For example: an attendee from Spain will obtain a Spanish company. Processing time is 180 days. Attendees have to submit the signed version of the valuation report as well as a copy of all working papers (hard copy and/or electronically).